Since we found out we are having another boy, we have decided to decorate our son's nursery in navy and gray. 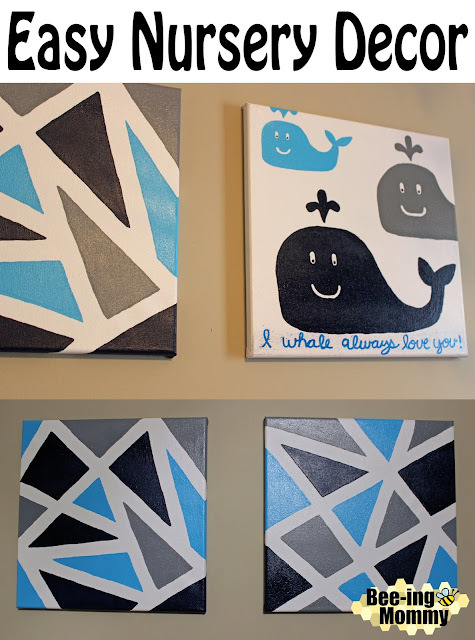 We originally were going to do a geometric nursery but we ended up buying a couple navy items with whales on them so we decided to do a mixture of geometric and whales. I painted some paintings and made a geometric baby mobile for my son's nursery. 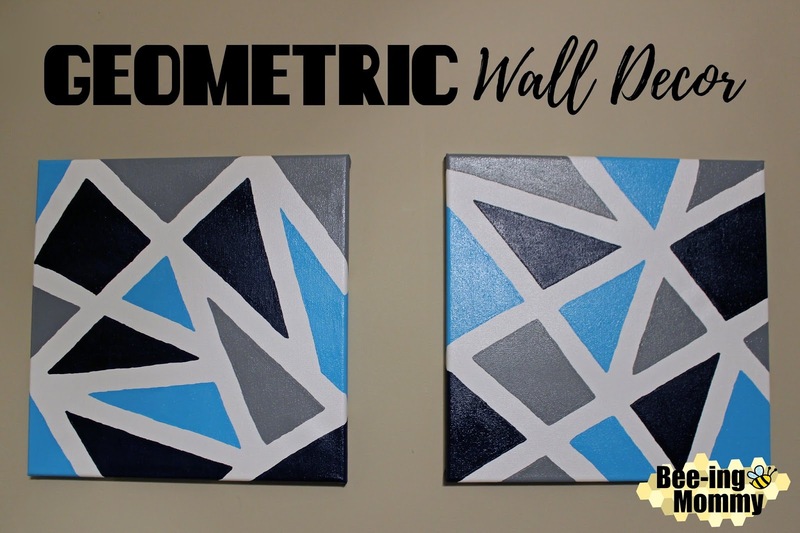 The geometric paintings turned out pretty cool looking but ended up taking a lot longer than I thought they would because the lines weren't straight when I pulled up the painter's tape so my OCD kicked in and I had to fix them so hopefully you will have better luck than I did. 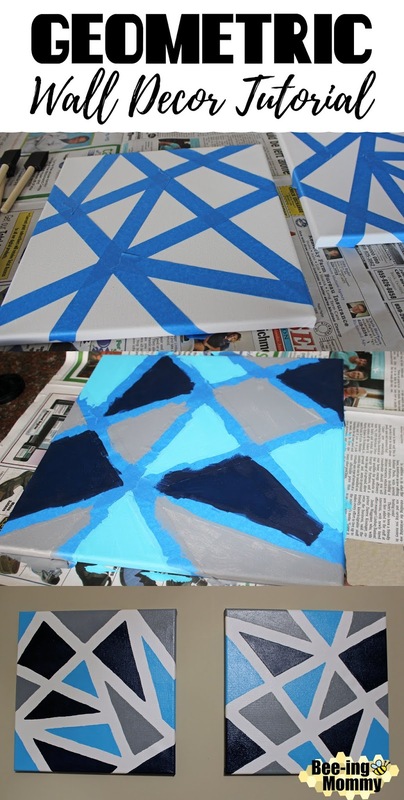 These geometric paintings would also make a great children's activity. Put the tape down, you can spell out a word or have your child practice their shapes and make geometric shapes like I did. 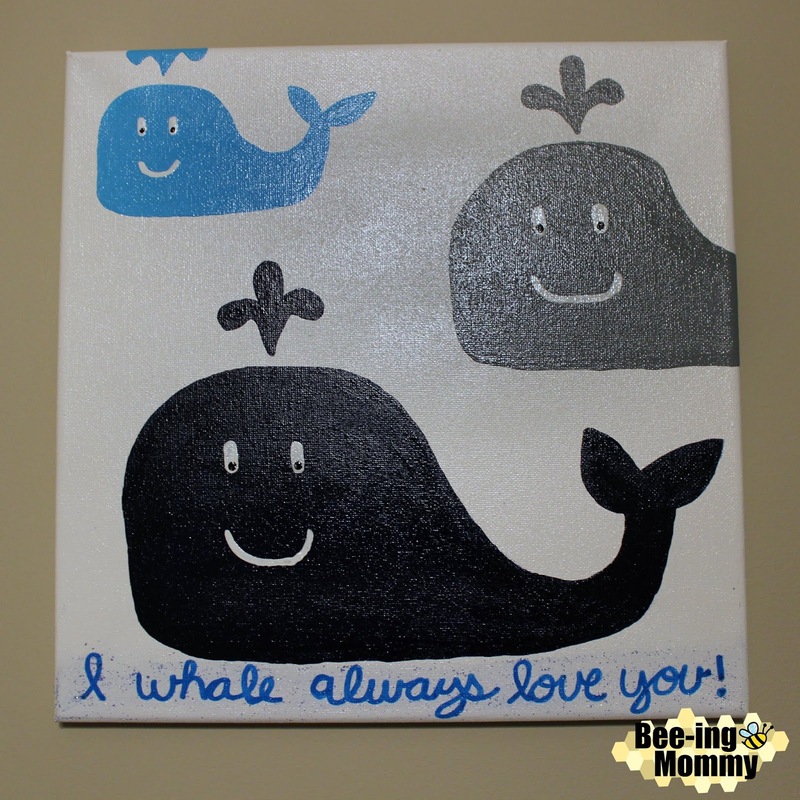 Then have your child paint the canvas however they want, pull up the tape and you have a cool painting they can hang on their wall. 1. 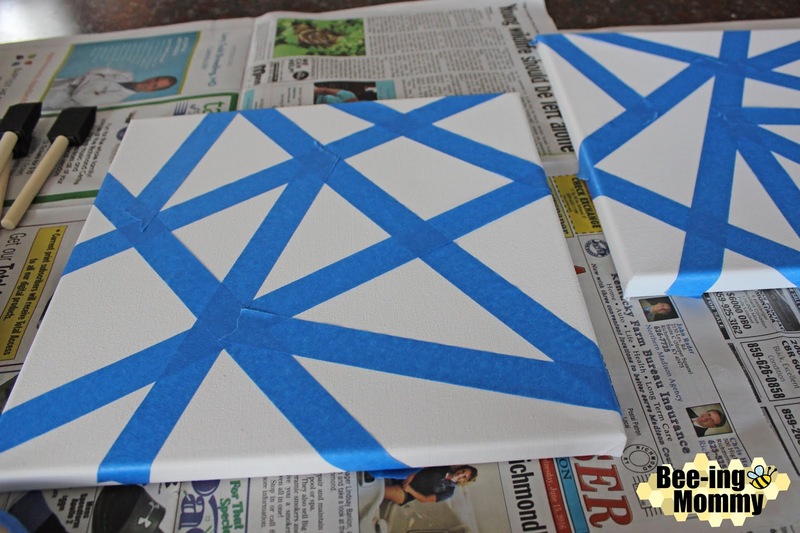 Using the painter's tape, create geometric shapes. I mainly made triangles but you can make any kind of shapes or pattern you want. Make sure to push the painter's tape down flat, especially on the edges to keep the paint from going under it. 2. Paint your canvas. 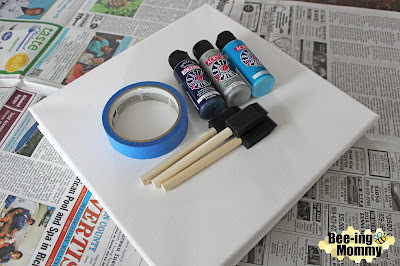 You can paint your canvas all one color or paint it a variety of colors. I used navy, gray and light blue to paint my canvas. Apply a second coat if needed. Let Dry. 3. Once the paint has dried, carefully pull up the painter's tape. If you are lucky your lines will be straight and you will be done. Unfortunately some of the paint got under the painter's tape making my lines uneven as you can tell in the picture below so I had to fix it. 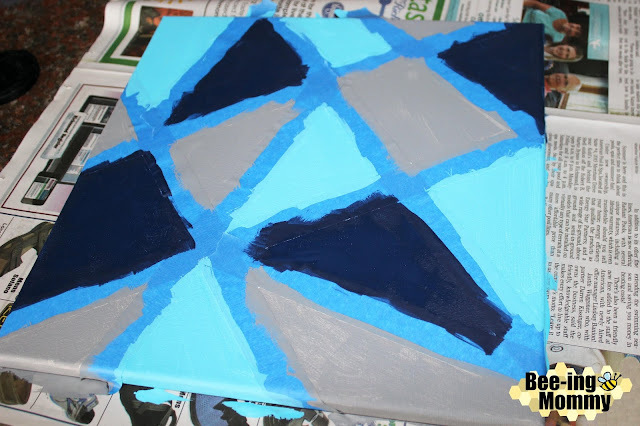 I took a thin tip paint brush and carefully outlined my shapes with paint creating straighter lines. Let Dry. 4. Optional: Once your paint has dried and you are satisfied with your painting you can add a clear gloss spray to help seal your painting. This will give the painting a shine and help protect it from water and dust. 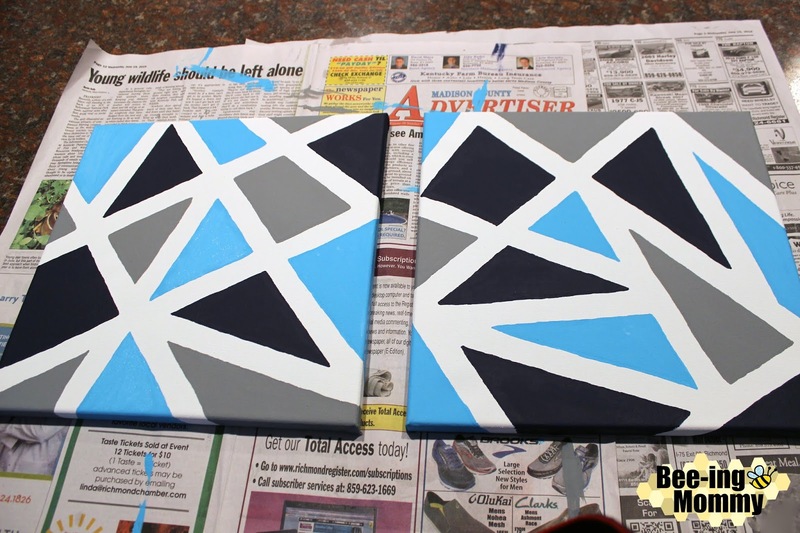 I used Rust-Oleum Ultra Cover Clear Gloss Spray on my paintings. This step is of coarse Optional! 5. Hang your paintings and enjoy! 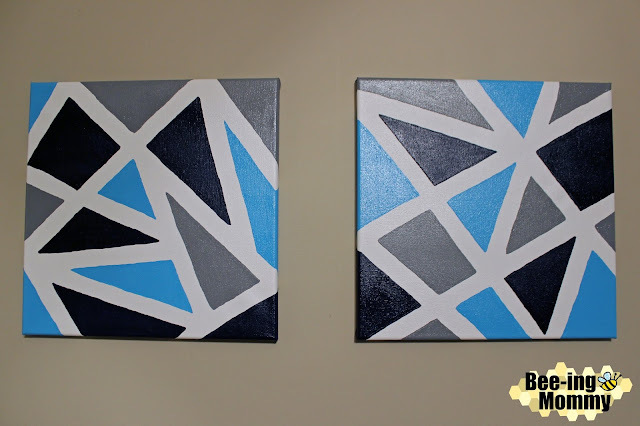 The geometric paintings are pretty easy to make and I think they look really cool. 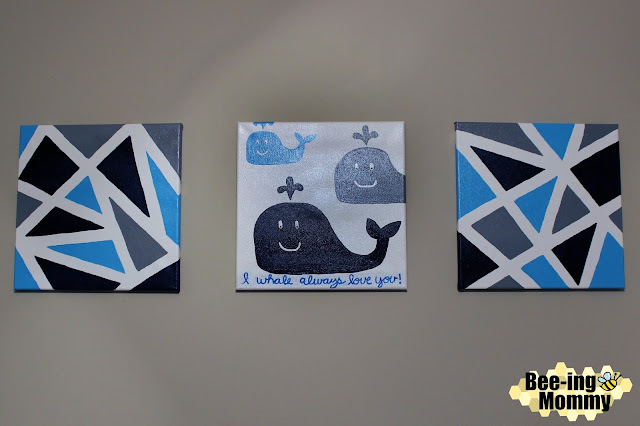 You can make the paintings in any color scheme or any geometric shape you choose. 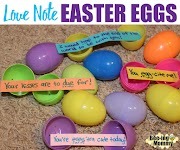 You can also spell out a word or letter with the tape if you don't like the shapes. 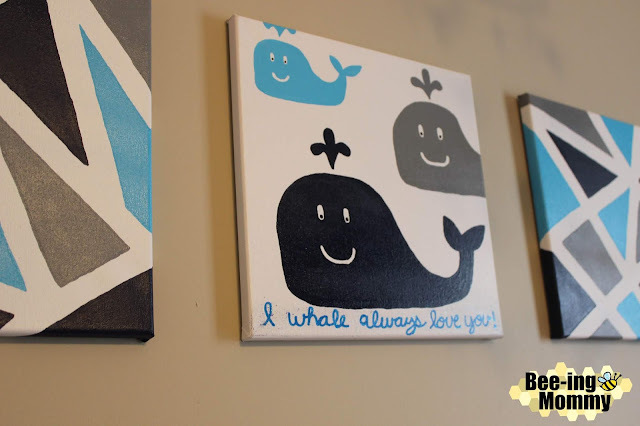 Turn the paintings into a fun children's activity by having your child paint the canvas to create a canvas for their room. Since we bought some items with whales on them I decide to make the third painting of whales. I used the same colors I used for the geometric paintings and painted three whales on a canvas. I then used a paint pen to write the saying, "I whale always love you!" on the canvas. I hung the three canvases above my son's crib fro some cute nursery decor. 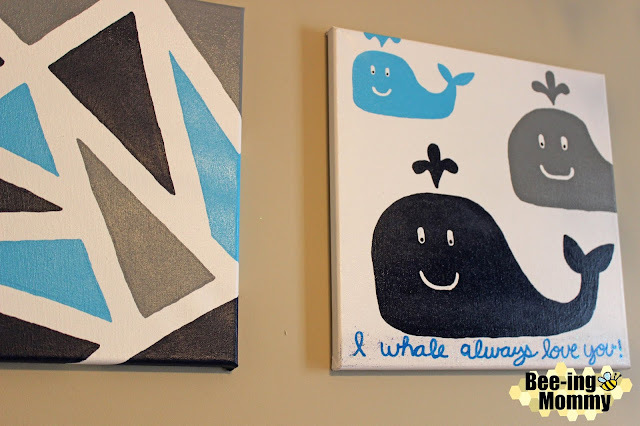 I like the geometric paintings better than the whale painting but I think they go well together. The geometric paintings are perfect for any room in your house - bedroom, nursery, living room, bathroom. 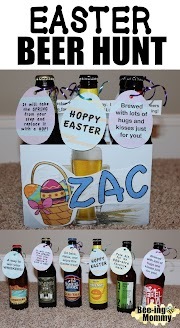 They also make a nice gift, just make sure you choose a color scheme that matches their home. 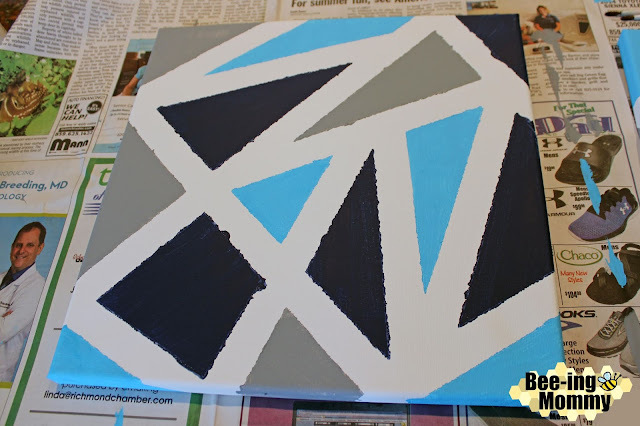 You can make the geometric paintings on any size canvas and in any color scheme to get a different look. You can also add an accent painting to the the geometric paintings like I did. Hopefully when you remove the painter's tape you will have straighter lines then I did so you don't have to spend extra time going over it. Good luck and happy painting! 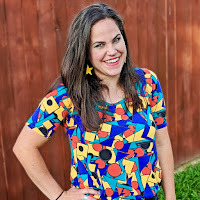 You might also like the Geometric Baby Mobile I made out of paint chips to match my son's nursery.